In the open air ethnographic museum in “Etara” visitors can see the big variety of Renaissance architecture of the Balkan Mountains and the only one device in Bulgaria of the old technique of water collection. In the craftsmen street shops visitors can see the manufacturing process, get to know the original instruments, speak with the master craftsman and have a marvellous experience creating with his help some traditional object. 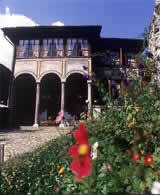 It is a small town proclaimed museum and situated at only 10 km from Veliko Tarnovo. The atmosphere of the town is very singular; the paved streets give it a very peculiar spirit, which all visitors enjoy. Bozhentsi is the paradise for painters, photographers and for all who wants to enjoy the most beautiful sceneries in the world. The village of Bozhentsi was founded with the arrival of the Turkish by people who were trying to escape from the capital of Veliko Tarnovo. The architecture is typical of the Balkan Mountains; therefore, the village was proclaimed as a historical and architectural reservation. What gave fame to the town of Tryavna was the silver art, woodcarving and iconography, and also because in Tryavna was founded the first Art School. The town attracts visitors for its atmosphere. The church “Saint Archangel Michael” represents a monument with national importance for its woodcarving and iconography, fruits of the Tryavna School. The “Kapitan Abuelo Nicholas” square preserves the authentic style of the beginning of the XVIII century and there is also located the Clock Tower of Tryavna. The Daskalov house is famous worldwide for “the two suns that never set” and also for harbouring the only Woodcarving Museum in Bulgaria. 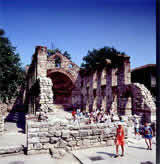 It is one of the most ancient towns in Europe. This small seaside town was built over a small rocky peninsula and is an indescribable beautiful place. Its medieval temples with Byzantium style and its wooden houses from the XIX century have converted the town into a “Human Heritage” site. It is located very close to Burgas and Varna. Sozopol is situated on the Black Sea coast, a few kilometres from Burgas. In Sozopol is celebrated the Annual Festival of Arts, which attracts a lot of tourists for its artistic value and the unique cultural atmosphere that is accentuated by the singular renaissance architecture, with which the town is famous for.